Introduction: It is know that inadequate eating habits and diverse types of foods lead to gastroesophageal reflux and so to the pharyngolaryngeal. Aim: The present work is justified for the lack of local data regarding the problem and it aims: to detect the manifestations of laryngeal-pharynx reflux; to determine eating habits of the manauenses (people from Manaus) which damage laryngeal-pharynx structure; to correlate the laryngeal manifestations of laryngeal-pharynx reflux with the eating habits of the manauense population; to detect inadequate and harmful alimentary habits to the laryngeal structures and to evaluate the susceptible population groups to laryngeal-pharynx reflux. 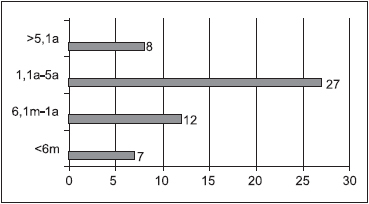 Methods: The methodology consisted of interviewing patients who had already undergone laryngeal-pharynx examination of compatible videolaryngoscopy with reflux, including male and female adults. There were question regarding alimentary habits and the characteristic symptoms of the pathology. Results: Results revealed that such pathology affects mainly women aging from 20 to 40, who usually have their meals at the workstations, and whose eating habits are the ingestion of fried food, coffee, tea, pepper, flour, cooling, tapioca and tucupi, and the symptom are dyspepsia (indigestion); pharynx globe; dysphonia; hoarseness; dry cough; odinophagy as the main laryngeal symptoms; presence of glottic clefts; nodules; hypertrophy of tonsils and polyps associated to laryngeal pharynx reflux. Symptoms usually remained between 1 and 5 years. Gastroesophageal reflux (GER) is a disease caused by an anatomical and/or functional failure of the contention mechanism of the gastric substances in the stomach (1-2). GER and laryngopharyngeal reflux (LPR) are the passage of the gastric substances into the stomach and from this to the pharyngeal and laryngeal areas respectively. Because of the content of acid in the stomach (chloridric acid) ascends to laryngeal-pharyngeal structures, complaints in the field of phonoaudiology have been reported. Such complaints can comprise dysphonia, hoarseness, globus sensation, cough clearing, dry coughing, sore throat, odynophagia (painful swallowing) and dysphagia (5). Pharyngitis and laryngitis have been routinely related to LPR, by showing that the larynx and pharynx have been suffered the consequences of gastric dysfunction, although such structures are not close to the stomach (6-7-8). It is commonly known that eating habits such as large amount of food, insufficient mastication, sleeping soon after meals and evening meals might lead to GER and LPR (4-9-10). With the technology advances in the past few years, women and young people have been considered the new group of individuals to suffer from symptoms related to LPR, as this group has been under long hours of working and evening lessons. This situation does not allow them to have proper meals (8-11-12). Fat, fried, canned food, colouring chocolate, caffeine, soft drinks, spices and carbohydrates (pasta, flour, etc) can lead to GER and LPR. - To establish and correlate the main laryngeal symptoms and pathologies present in cases of laryngopharyngeal reflux. A prospective study had its project submitted and approved by the Ethics Committe Research of the Centro Universitário Nilton Lins in June, 2006, under the process #02/06-IC/CEP. Fifty four patients, classified as subjects of the research, were chosen to take part of this study. They were assisted from July to September, 2006 in public and private ENT Services in Manaus/AM, (Brazil) in the following areas: downtown, Praça 14 de Janeiro, Compensa, Cidade Nova and Cachoeirinha. Patients, both male and female, were chosen according to age (over 18) and their videolaryngoscopy exam should be compatible with laryngopharyngeal reflux. All patients signed a Free and Clear Consent Term agreeing with being part of the research. The videolaryngoscopy exam was performed through 70º laryngoscope (Endoview), with lidocaine-based spray anaesthesia in loco, and the following findings were considered signs of laryngopharyngeal reflux: oedema and/or hyperemia of the arytenoids and space between them; hyperemia of the laryngeal face belonging to the epiglottis and dyskeratosis alterations of the surface of the vocal folds. The subjects assisted in the services previously mentioned were afterwards sent to Serviço de Atendimento Fonoaudiológico (SAF) do Centro Universitário Nilton Lins (CUNL) de Manaus-AM (Phonoaudiology Service of Nilton Lins University). As patients arrived at SAF, they were interviewed regarding their profession, meal sites, eating habits, gastrointestinal and laryngeal symptoms, length of symptoms and their start. Afterwards, data were computed, analyzed and discussed according to the target of the study. The fifty four patients who took part of this study were classified as subjects of the research. 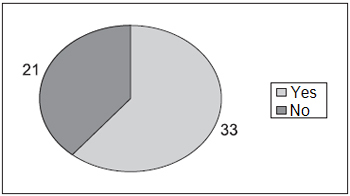 Chart 1 displays the percentage distribution of the 54 subjects regarding gender; 37 subjects (69%) were female and 17 of them (31%) were male. Chart 2 displays the total distribution regarding age; patients aging from 20 to 40 prevailed with extremes of 20 and 85 years of age and the average was 45.3 yr. Chart 2. 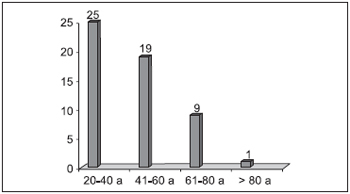 Total Distribution of the 54 subjects regarding age - 25 patients - 20 to 40 years 19 patients - 41 to 60 years 09 patients - 61 to 80 years 01 patient - over 80 years. 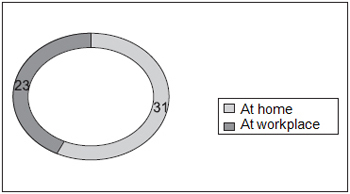 Chart 3 displays total distribution regarding meal sites; it is observed that 31 of the subjects have their meal at workplace. Chart 3. Total Distribution of the 54 subjects regarding meal sites - 31 subjects - at home 23 subjects - at workplace. Chart 4 displays total distribution regarding diet routine; 54 subjects have lunch, 49 have breakfast and 51 of them have dinner. Chart 5 displays total distribution regarding the type of items found in manauense cuisine that can lead to a LPR and also regarding the number of people who have such diet. The followings are those items which cause LPR, and which are also ingested by most of the analyzed subjects: coffee, tea, fried food, red pepper, tucupi, flour, tapioca and soft drinks. (tucupi: cassava-root starch; tapioca: thick rice pudding-like made mostly of cassava starch). 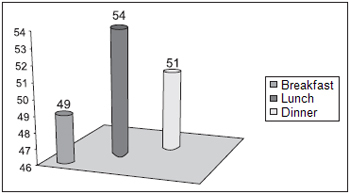 Chart 6 displays percentage distribution regarding gastrointestinal symptoms, what was observed in most patients with LPR. Such symptoms consisted of: pyrosis (25), epigastralgia (23), postprandial fullness (17), eructation (12), sialorrhea (10) and flatulence (10). 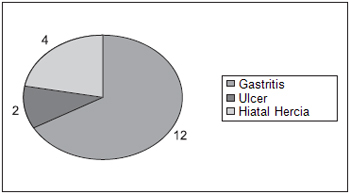 Chart 7 displays total distribution of gastroenterology diseases which was present in 18 of the subjects. They consisted of gastritis (12), hiatal hernia (04) and ulcer (02). 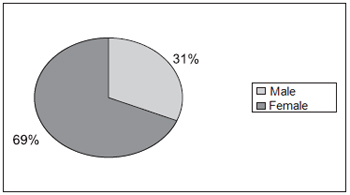 Most patients did not report such diseases (36). 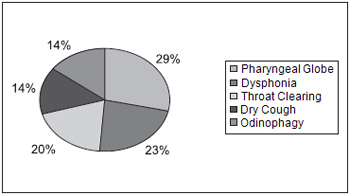 Chart 8 displays percentage distribution regarding laryngeal symptoms, when it was possible to observe the following: pharyngeal globe 29% (37); dysphonia 23% (31), cough clearing 20% (26), dry cough 14% (19); odinophagy 14% (19); and others (burning (13), windpipe obstruction (07), itching (06), night choking (06), voice loss (01) and halitosis (01)). 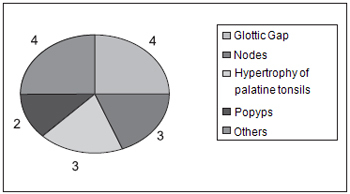 Chart 9 displays percentage distribution of the laryngeal diseases related to LPR. All subjects presented LPR at videolaryngoscopy exam. The followings were observed among other laryngeal diseases related to LPR: glottic gap 27% (04); nodes of vocal folds 20% (03); palatine tonsils 20% (03); polyps 13% (02) and others 20% (chronic laryngitis (01); chronic pharyngitis (01) and allergic pharyngitis (01)). Chart 10 displays total distribution regarding the length of laryngeal symptoms related to LPR reported by the 54 subjects. Most patients reported having such problem between 1.1 and 5 years (27), what represents a case of chronic condition. This can be justified due to the fact that women have been under double work shift (sometimes triple), being therefore more susceptible to laryngopharyngeal reflux (LPR), a type of disease that is related to daily stress routine. The findings of the current study regarding gender agree with most of the references examined. ECKLEY(4) found 110 affected females out of 157 patients, and MARAMBAIA (6) found 35 females among 61 patients. MARINHO (12), when studying 20 subjects, found an average age of 44.6 years; the minimum age was 18 and the maximum was 72 years. ECKLEY (1) reported a predominance of LPR on extreme ages between 21 and 85. These findings are alike to the ones of this study. This age range covers the economically active population, therefore, they are more susceptible to stress condition and consequently to LPR. 'Eating out' is a factor that usually leads to LPR, as it is not possible to have total control over the quality of the items included in the meals. MACEDO FILHO (18) states that when meals take place out of home, even when following a correct timing diet, the chances to develop LPR are even greater. These findings are observed in this study as most subjects have meals at workplace, although missing meals does not occur so often. CHONE et. 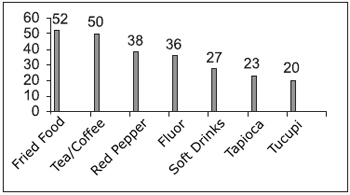 al (20) researched eating habits related to laryngopharyngeal reflux, and observed that the ingestion of tea and/or coffee was 100%; fried food and spices was 67% and sparkling drinks was 33%. PRADO et. al (9) state that greasy food (fried food for instance), carbohydrates (flour, pasta and tapioca), sparkling drinks and items containing high rate of caffeine (tea and coffee) cause failure on the inferior esophageal sphincter, altered clearance capacity, delay on gastric emptying, abnormalities on esophageal mucosa among others, which might lead to gastroesophageal reflux and consequently to laryngopharyngeal reflux. GOMES et. al (10) found gastrointestinal symptoms in 70% of the subjects with laryngopharyngeal reflux. COSTA et. al (19) examined 87 subjects and found the following prevalence of gastrointestinal symptoms in decreasing sequence: pyrosis, epigastralgia, postprandial fullness and eructation. GAVAZZONI et. al (13) found the following percentages regarding gastroenterology disease presented by the subjects of their study: gastritis (25%); hiatal hernia (9.9%); esophagitis (9.9%) and duodenitis (4.54%). Gastritis also prevailed in the current study, though esophagitis and duodenitis were not mentioned by any of the patients. Pharyngeal globe (77.27%), dysphagia (56.81%), dry cough (54.54%), dysphonia (50%) and throat clearing (38.64%) were the results found by GAVAZZONI et al (13) regarding the frequency of laryngeal symptoms in the subjects of their study. These data agree with the results of this study, except the dysphagia one. According to BASTOS et. al (1), laryngeal findings in cases of laryngitis caused by reflux may vary by the severity of the case; they might be from hyperemia and light oedema of the posterior third of the larynx to contact ulcer condition, laryngeal granulation, leukoplakias, interarytenoid pachydermia, subglottic stenosis and neoplasic degeneration of the epithelium. It is believed nowadays that a large number of benign injuries of the vocal folds such as nodes, polyps and reinke's oedema are also related to LPR, as local inflammation might lead to an excessive phonatory condition what can cause secondary injuries. - Most of the subjects present symptoms which are compatible to LPR between 1.1 and 5 years of age. 1. Bastos WA, Eckley CA, Choi KFF. Aspectos laringológicos e vocais relacionados ao refluxo laringo-faríngeo. In: Tratado de Fonoaudiologia. São Paulo. Ed. Tecmedd. 2a ed. 2005. 2. Gabiatti MA. Manual da Cozinha Amazonense. EMBRAPA - AM. 2004. 3. Moraes Filho JPP, Chinzon D, Eisig J. Prevalence of heartburn in the brazilian population. Diseases of the esophagus. 2004. No prelo 4.Eckley CA, Zuna G, Duprat AC, Costa HO. Repercussões Otorrinolaringológicas do refluxo gastro-esofágico na infância. Revista Brasileira de Otorrinolaringologia, 67(1):67-72. 2003. 5. Castagno L A, Gastal OL, Castagno S. Faringite e laringite asociadas ao refluxo gastro-esofágico. Revista Brasileira de Otorrinolaringologia, 72(4):15-25. 2003. 6. Marambaia O, Andrade NA, Varela DG, Juncal MC. Refluxo gastro-esofágico: estudo prospectivo correlacionado a achados laringoscópicos precoces com phmanometria de 24 horas de 02 canais. Revista Brasileira de Otorrinolaringologia, 68(4):527-531. 2002. 7. Costa HO, Burati DO, Duprat AC, Eckley CA. Doença do refluxo gastro-esofágico: análise de 157 casos. Revista Brasileira de Otorrinolaringologia, 69(4):458-462. 2002. 8. Moraes Filho JPP, Cecconeloo I, Gama RJ, Castro LP, Henry MA, Meneghelli UG, Quigley E. Brazilian consensus group. Brazilian consensus on gastroesophageal reflux disease: proposals for assessment, classification and management. J Gastroenterology. 97(2):241-248. 2002. 9. Prado FC, Ramos J, Valle JR. Atualização terapêutica. São Paulo. Ed. Artes Médicas. 20a ed. 2001. 10. Gomes GF, Coelho JCU, Salvalaggio PRO, Sebastião APM, Gums SD. Achados histológicos na parede posterior da laringe em pacientes com refluxo gastro-esofageano. Revista Brasileira de Otorrinolaringologia, 67(6):770-774. 2001. 11. Mamede RCM, Elchenberger GCD, Garcia Júnior D, Dantas RO, Leite GJ. A hipertrofia da base da língua está relacionada ao refluxo laringo-faríngeo? Revista Brasileira de Otorrinolaringologia, 67(1):73-76. 2001. 12. Marinho VP, Eckley CA, Scala WR, Costa HO. Phmetria esofágica de 24 horas de duplo canal no diagnóstico da laringite por refluxo. Revista Brasileira de Otorrinolaringologia, 66(2):110-114. 2000. 13. Gavazzoni FB, Ataíde AL, Herrero Júnior F, Macedo Filho ED. Esofagite por refluxo e laringite por refluxo: estágios clínicos da mesma doença? Revista Brasileira de Otorrinolaringologia, 68(1):86-90. 2000. 14. Johanson JF. Epidemiology of esophageal and supraesophageal injuries. J Med. 108(4A):995-1035. 2000. 15. Araújo CM. Análise crítica da pHmetria esofágica no refluxo gastroesofágico e laringofaríngeo. Dissertação de Mestrado - Faculdade de Ciências Médicas da Santa Casa de São Paulo. 2000. 16. Pinho SR. Manual de higiene vocal para profissionais da voz. São Paulo. Ed. Pró-Fono. 1999. 17. Loughlin CJ, Koufman JA. Paroxysmal laryngospasm secondary to gastroesophageal reflux, 1998. Disponível em: jkoufman@bgsm.edu. 18. Macedo Filho ED, Hebbel WS. A importância do refluxo gastro-esofágico como causas de manifestações otorrinolaringológicas tem sido supra ou infra-valorizada? Revista Brasileira de Otorrinolaringologia, 63(4):402-404. 1997. 19. Costa HO, Eckley CA, Fernandes AMF, Destailleur D, Villela PH. Refluxo gastroesofágico: comparação entre achados laríngeos e digestivos. Revista Portuguesa de Otorrinolaringologia. 35(1):21-28. 1997. 20. Chone CT, Gomes CC. Doença do refluxo gastroesofágico em otorrinolaringologia. Revista Brasileira de Otorrinolaringologia, 61(4):298-318. 1995. 1. Master degree in Tropical and Infective Diseases by Universidade Estadual do Amazonas - ENT Doctor and Professor of Medicine and Phonoaudiology at UEA and Centro Universitário Nilton Lins. 4. Senior student in Medical School by Centro Universitário Nilton Lins. This article was submitted to SGP (Publication Management System) of R@IO on November 23rd, 2007 and approved on March 13th, 2008 at 19:07:25.